Don joined the VAE in the early 1970’s and became involved in both the Stowe and Essex car shows. He was club treasurer from 78 – 87 and served several terms on the Board of Directors until 2002. 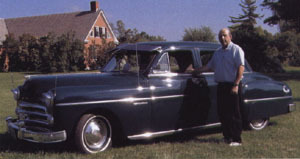 He has owned several cars and trucks over the years including his favorite, a 1950 Dodge. Don has been a very valuable club member and plans to remain active for many years to come. This picture was taken at the June 2003 Shelburne “World of Wheels Weekend”.